At a couple of events with my colleague Jonathan Kwan and our friends, a fairly pointless debate keeps popping up. The debate started with one our friends saying golf is not a sport. Since debating is quite fun, we went with it, arguing golf is a sport. This all boiled down to a dumb argument on how we define what a sport is. The main point of contention was whether there is enough physical exertion in golf to constitute it as a sport. As one would expect, the debate turned into everyone trying to get their point across, resulting in plenty of shouting, even if it was all in good spirit. It only ends when one of our friends brings up a new debate that is equally pointless. She attempts to define the small town she grew up in as a city, which then opens up a brand-new debate on how big a town's population has to be for it to be considered a city (For all the readers out there, a population of 17,000 does not make your town a city). The same insanity ensues as with the golf debate, again focused on just a definition, which keeps changing arbitrarily. Throughout both of these debates, it was always accompanied by plenty of laughter. Unfortunately, most of our definitions usually do not stay the same, which just adds to the absurdity of what is going on. At least in the world of computers, we have some solid standard definitions... or do we? 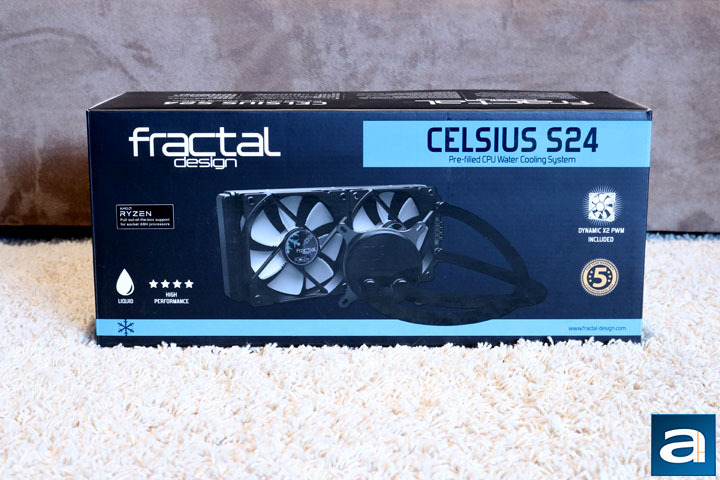 Today, the definition of all-in-one liquid cooling might change with the introduction of the Fractal Design Celsius S24, which brings a couple of new features to the table. Read on to find out what those are! The Fractal Design Celsius S24 arrived all the way from Dallas, Texas. It probably got quite a bit of a shock when it landed in cold Calgary, Alberta. The shipping box arrived in good condition with few dents. None of the dents should cause any alarm, as they are not very large and do not put the safety of the contents in danger. As expected, the area with the most damage were the corners; they were a bit beat up. Otherwise, there was some tape to keep the box together. 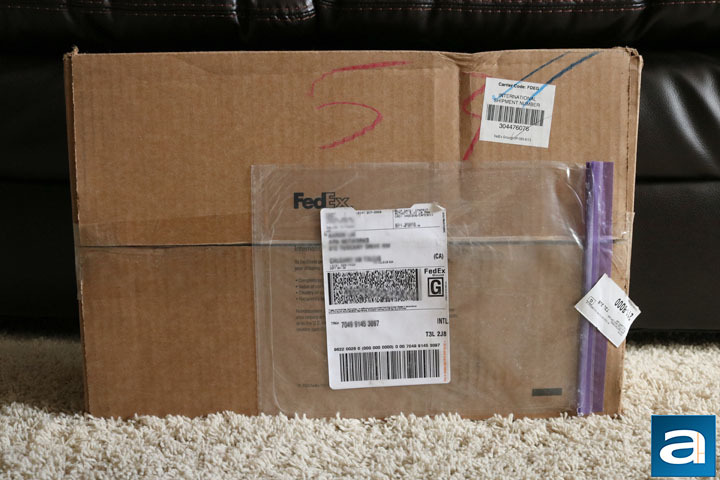 After opening the shipping box, there was some brown paper to cushion the product on all sides; at the same time preventing it from moving around. Any movement has the potential to damage the contents, so having sufficient padding is important. Overall, the men in orange and purple overalls did a good job at ensuring the safety of the product. On an unrelated note, saying orange and purple overalls for people working for FedEx is definitely not as catchy as saying brown overalls for workers with UPS, haha. The blue and black colors of the Fractal Design Celsius S24 packaging fit the theme. The colors complement the snowflake image theme on the box and the cooler itself. I appreciate the simple approach Fractal Design took to the front of the box; mainly with not much going on. Front and center is a picture of the cooler, while the Fractal Design name and the product name gets their own share of real estate on the front. 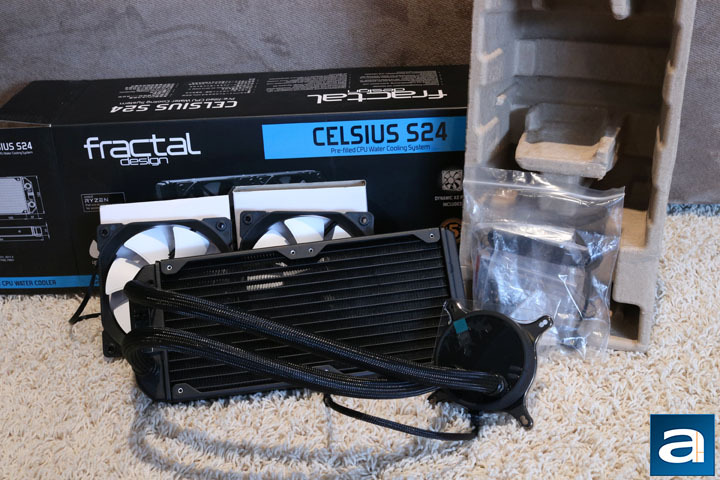 Right from the get go, the definition of an all-in-one liquid cooler is thrown out the window; in its place below the Celsius S24 we find a new line, "pre-filled water cooling system". I will explain later why it is different. On the right end of the package, the five-year warranty and the included fans are highlighted. To the left, we find that this cooler is compatible with AMD Ryzen, it is a liquid cooler, and has high performance. The rest of the retail box follows a similar design, highlighting different important aspects on each of the different sides, such as dimensions and technical specifications. Packaging was done similarly to other water coolers I have reviewed in the past. There was a base soft cardboard cutout housing all the components in different sections. The radiator and the fans had their own extra thin cardboard cover, while all the installation components were in plastic bags. The instruction manual was also found in a plastic bag with some other important information. The water block and the tubes had a plastic bag covering them, but the water block had extra protection; namely, a hard plastic covering for the copper plate, which has pre-applied thermal paste and a soft rubbery plastic sticker on top to prevent any scratches to the surface. I found the packaging to be enough to prevent any damage to the components, which is proved by the state I received the Fractal Design Celsius S24 in.